David Robinson takes his Pentax MZ-S and Z-1P, and a spare pair of underpants, into the Kruger Park for some brilliant wildlife shots. We explain the basics of scanning and show you how to make your pictures digital. There are many gadgets to help you support your camera...you could even use a tree! Regular contributor, Keith Hughes, offers a colourful technique for shooting indoors. Learn how this biologist tempted a wild buzzard to come close enough to be photographed. 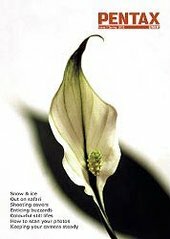 A beautiful collection of minimalist still lifes from Paul Brough...the photographer who shot this issue’s cover image. Expert tips from successful professional, Christopher Nicholson, on how to shoot perfect covers and make your camera pay. Your Pentax compact has excellent versatility, especially at night. Steve Bavister explains. Why do snow pictures often come out grey? Find out here, plus general shooting tips. Pentax product launches and promotions, reader and local group news and events.